Rear view This mono machine is one of the lower end PAL Betamax units with only a fairly standard set of features. It has 12 electronic channel presets, the tuning for each of these is done individually on the top of the unit using a mechanical thumbwheel. These are seleted by buttons on the right hand side, labelled using letters even though they are displayed numerically. (the letter template could be changed at a push). The unit comes with a 4-program timer that was fairly special for its time. More uncommonly though for a PAL machine, the clock was in 12 hour am / pm layout. Unusually, when setting a program, the unit asks for the record length rather than an end time. Fortunately, both are shown in the display at the same time. The time display also shares a trait with some Sony models, that is the first half of a minute is shown by a blinking top dot between the hours and minutes and the second half by the bottom dot flashing. The VCR supports colour picture search and still, but picture search is not capstan driven and still just stops the capstan motor. Pressing picture search again switches to a wind mode, there is no mechanical difference between the two. 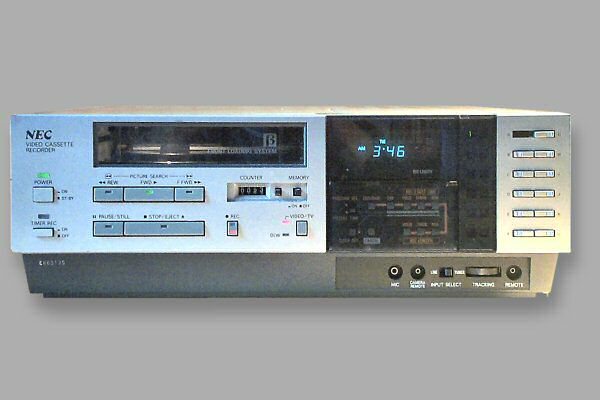 Other features include a repeat memory function set by a switch at the back and a mirror to view the tape remaining of a loaded tape. A wired remote was available for this VCR but it is not clear if it was included in the standard package. If whilst winding a tape, rewind is pressed (or the other way) the machine does not first brake but instead instantly changes the wheel motor direction to full power, which is not good for the tape. The same is true whilst in picture search. The rear of the unit has the standard UHF in/out and Audio/Video in/out. There is also a voltage selector and power switch.